Carnival Cruise Line has partnered with Lakeland, Florida-based Brew Hub to become the first cruise line to can and keg their own private label beers. The agreement was announced on Sunday during an event aboard Carnival Magic at PortMiami, and is the first of its kind between a craft beer manufacturer and a major cruise line. 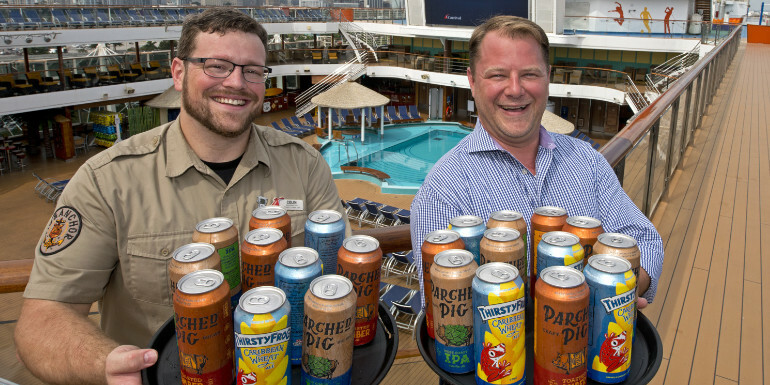 The three beers, which are based on recipes developed by Carnival’s brewery team on Carnival Vista and Horizon, are now available in 16 oz cans and on tap across the line’s 26 ships and private destinations. ​Carnival introduced the first North American brewery at sea in 2016, when Carnival Vista debuted. Since then, the line has served nearly 300,000 pints of its private label beer to guests. The brewery team has also created unique brews based on the seasons, like a Pumpkin Spice Ale and Miami Guava Wheat. When the third Vista-class ship, Carnival Panorama, debuts in California in December, it will also include an onboard brewery. Do you enjoy Carnival's own ship-brewed beers?